We would like to present a new feature you can use to customize your social icons using a collection of some excellent examples of functional, original, and effective footers. 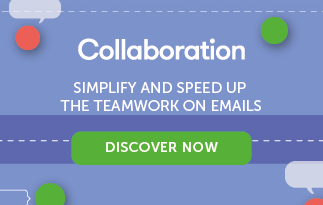 If you think that the footer of your emails is a marginal element, merely an accessory, it’s time to rethink the matter from another point of view. A footer, as the name suggests, is the base, the pedestal on which your campaigns and newsletters rest. The footer is used for that set of brand communications that fall within the sphere of trust: credibility, recognition, reliability, and reputation. As we said, it is the base with which a company and recipient build a relationship of trust. Without affecting opening rates, the footer makes a difference especially in those phases of the funnel in which your contact is not yet fully engaged, but is located in a gray area where he or she will have to decide whether to give credit to your brand (by continuing to receive emails) or leave (unsubscribe). New social icons: add WhatsApp! We decided to touch on this theme again because we’ve introduced a new, valuable feature in MailUp: during the email creation phase, it lets you add new social icons to the footer, some of which already exist, and others which can be entirely customized. The new feature can be found in the BEE editor: all you have to do is insert a Social module in the body of the message. Inside it you’ll find the new social icons and the Add custom icon feature you can use to insert a new element, complete with image and URL. Insert the logo of an instant messaging platform such as WhatsApp to allow the recipient to start a conversation with your company with a simple click. The operation is very simple: the feature is called Click to chat, and provides you with a URL (this: https://wa.me/<numberoftelephon>, where <numberoditelefono> is the phone number in full international format) to be inserted as a link in the social icon of your message. For a detailed explanation, you can read the dedicated page on the WhatsApp website. In a nutshell, this valuable feature lets you customize your brand’s social networks and trigger a conversational dynamic at the same time. Just think of the potential from a customer care perspective: by entering a number in the WhatsApp icon, the customer support team has the ability to monitor all those conversations generated by the email itself, responding to doubts and questions from recipients. 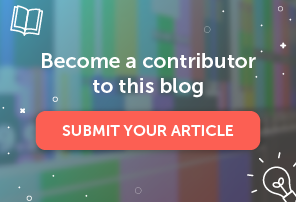 Now let’s take a look at some tips and ideas for creating a footer that excels in conveying trust which is simultaneously original, having an impact on the recipients. Although each brand can choose what to include, there are certain elements that cannot be missing in a well-designed footer. Let’s start from there, from what cannot be omitted. The anti-spam laws of most countries require that certain information is necessarily included in the email, and the footer is the place to put them. In the form of links (Unsubscribe is the most frequent), this option must give recipients the opportunity to no longer receive your emails. The best way to manage the unsubscription process is a chapter in and of itself, which we will not dwell on here (you can find everything you need to know in this blog post). Link to the company website: a logo with a link to the site or a short list of some other areas of the company website, such as a blog, the homepage, or even job offers in the company. Contact email address: this information can be requested together with the correspondence address. It is the email address that readers can use to “reply” to the message or get in touch. This is the footer section that answers the question “Why am I getting this email?” It is also a best practice in terms of deliverability, as it further reduces spam complaints and helps maintain your reputation as a sender. An example of a permission reminder? “You have received this message because you are subscribed to the MailUp blog”. To allow the reader to obtain information on the ways in which personal data are stored. This is a delicate operation due to the limited space available, but has great potential. An image lets you combine the personalization of a signature at the bottom with the incisiveness of an email marketing campaign. 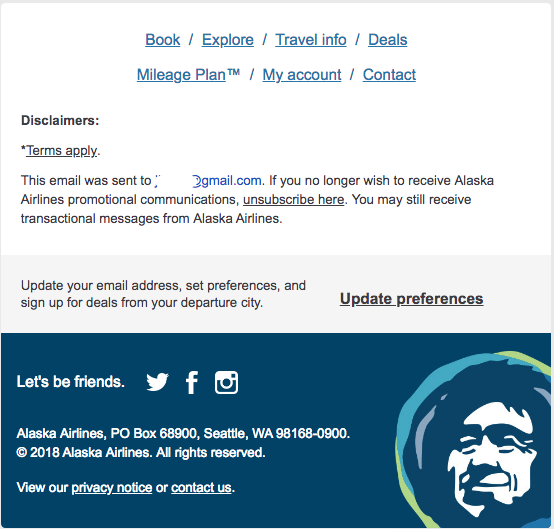 Alaska Airlines provides an excellent examle, which gives its footers a more distinct personality with an image. 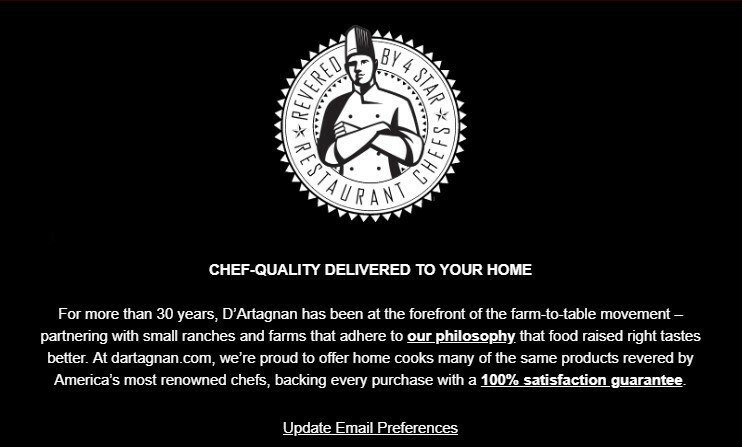 The footer below presents all the right ingredients (clear and unambiguous option to unsubscribe, privacy statement, contacts, colors consistent with brand identity and logo) and original copy to invite recipients to get in touch using the social profiles. If the footer is the place where your brand is recognizable, the payoff and claim are the best possible textual elements to give consistency and meaning to the footer. 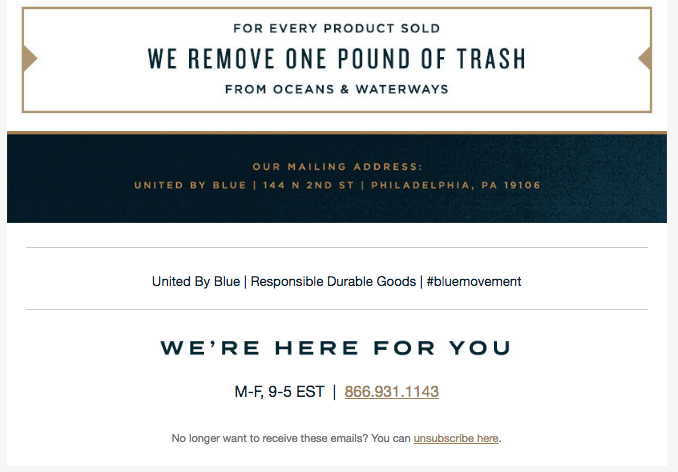 Two companies use their slogans particularly well in the footer: one is United by Blue, an outdoor equipment company, which closes its emails with a declaration of intent for the environment. The footer is well-structured thanks to a modular composition, and arranges the information in a hierarchical, orderly, and easily consulted way. The claim of Product to Project is closer to a real claim, which under the social icons explains its promise, the company mission. You may already know this, but the Preferences Center gives your contacts a place to update their profile and change options such as message frequency. The best practice is to make the link to the Preferences Center explicit and evident, leading potential unsubscribers directly to it. 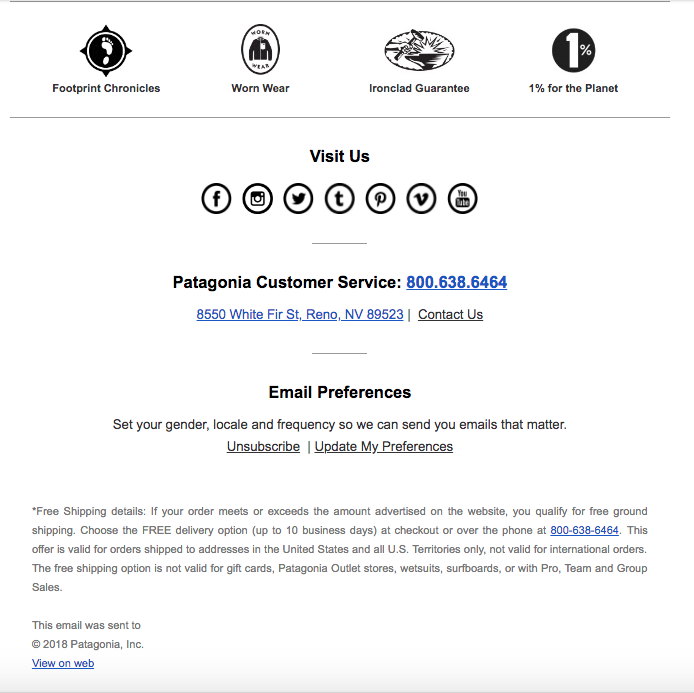 Patagonia does this quite well, inviting subscribers to use the Preferences Center with the promise to receive only emails that are in line with their interests with the subsequent mailings. This is similar to the payoff and claim, but is less advertising and more narrative. Communicating corporate values lets you give your emails a human touch and disseminates the history of the brand or information about any corporate social responsibility projects. 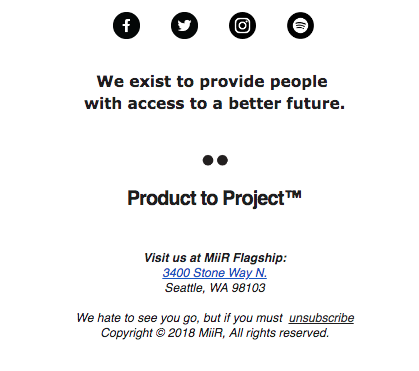 An excellent example is that of MiiR, which has developed a clean and simple footer with a “digression” dedicated to the company’s history, values, and mission. If the communicative potential of the footer is clear, now is the time to put it into practice. From an operational point of view, creating a footer is simple and immediate thanks to the drag-and-drop editor of the MailUp platform. If you haven’t tried it yet, now is the right time: request a trial to have access to all the platform’s features for 30 days, for free.